The hand rails round the stern went OK. 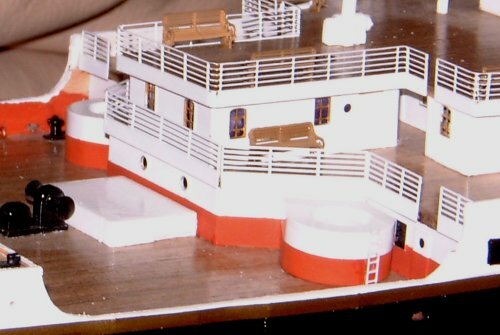 I did the angled rails first, the the rail across the stern, and finally the outboard rails. The rails round the docking bridge are going to be left till much later on. There are some very small parts (telegraph, etc.) to be fitted on the docking bridge and I want to fit these before I put the handrails in the way. 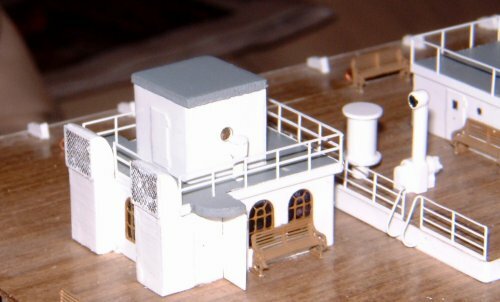 Here you can see the rails round the small deck house at the stern. The side rails were a tad long, so I trimmed the front of the deck where it sticks out over the windbreak for the door. This allowed the rail to come aft slightly so that the corners lined up. We have also got some rails for the aft of the forecastle and the for'd of the poop deck. I'm going to wait until I've got then rest of the rails for these parts before I fit these. 84 - Rails Rails for forecastle, poop deck & docking bridge. Think carefully about the rails. It's often better to wait until you've got a full set of rails for one area before you start tackling to job.